Okay everyone. It is my birthday tomorrow, and one of the things I wished for was my favourite swedish lollipop; snusklubba (also called dunderklubba or salmiak knotsen in Holland). In England, they don't eat salmiak. But in Sweden we love it. You can find it in ice cream, cakes, powder, chocolate and of course many different lollipops. But 'snusklubbor' has always been my favourites. They taste like a toffee vanilla, swirled with powdered salmiak (which is a very salt liquorice). Amazing. Although salmiak is NOT very healthy. Those who are pregnant, ill or have high blood pressure should limit or cut it out all together. But, back to what just happened. It is my birthday tomorrow and I wanted some of these amazing lollipops. You can't buy them anywhere except for in store at Totally swedish (but they are 3 hours drive from me, in London). I searched online and bought from Sweden would be an extra £20 plus in delivery. But then! I stumbled upon a sweetshop that only charged £6 delivery, so I sent the link to Gary. Today, FedEx shows up with a massive package. Gary who obviously knew what it should have been and the size of it opened it. He then came downstairs to ask if I wanted my gift early as the company had sent it completely wrong. I was like; okay.. It then turned out that each pack should have been £1.49, with TEN lollies in each pack. He bought four packs. This means I should have got 40 lollipops. In each pack was in fact, 150 (!!!) lollipops!!! And we got four of THOSE packs. So instead of getting 40 pops, I now sit on a very big chemical mountain of 600 lollipops. 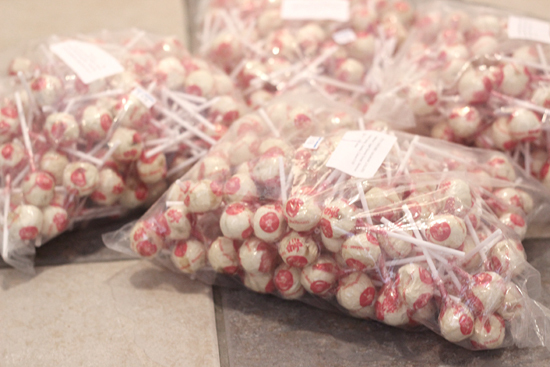 All I can say is; thanks for this amazing gift of 600 lollies for the grand total of £12. Couldn't be a better birthday (even though it is the day before). Where on earth shall I store these? ?